Apples enjoy a rich history that parallels the growth and development of our country. One of the caveats of land ownership during Colonial times was the planting of orchards. The early settlers would often plant their orchards before they built their homes! The first commercial nursery was established in Flushing in the 1700's. It was established by Robert Prince and was maintained for four generations. Many of us are familiar with John Chapmen AKA Johnny Appleseed. We envision him strolling around the countryside with a leather satchel full of apple seeds. As he casts out his seeds on his sojourn they magically sprout and yield thousands of young trees the following year. Unfortunately, it’s not all that easy to establish a functional orchard. Modern horticultural techniques have allowed for selective breeding of specific traits to be developed in the myriad of apple varieties that exist today. 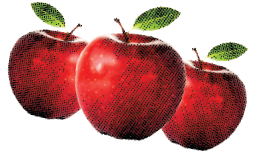 Some of these attributes might make the apples more resistant to disease, enhance sugar content, improve cold storage longevity, or increase tannin and acid levels, which yield higher quality ciders. The method for producing trees with the desirable genetics involves grafting. A nursery will take a particular rootstock and make a special cut in it that mates to the corresponding cut in the top (or scion). The rootstocks vary in their vigor – or how much juice they pump out of the soil and up the stem. A vigorous rootstock will produce a large tree. If you choose a rootstock with low vigor, you will get the opposite results. The trees are classified a Dwarf, Semi-Dwarf and Traditional Standard. For example, a Bud-9 rootstock will yield a tree that tops out at 10’ whereas an ELMA111 rootstock will get you a tree that will be 20’ tall when it’s mature. The dwarf and the semi-dwarf trees are preferred because they are easier to prune, spray and harvest apples. We expect our trees to be no more than 10’ tall. While our orchard appears widely spaced, these trees will fill in after several years. 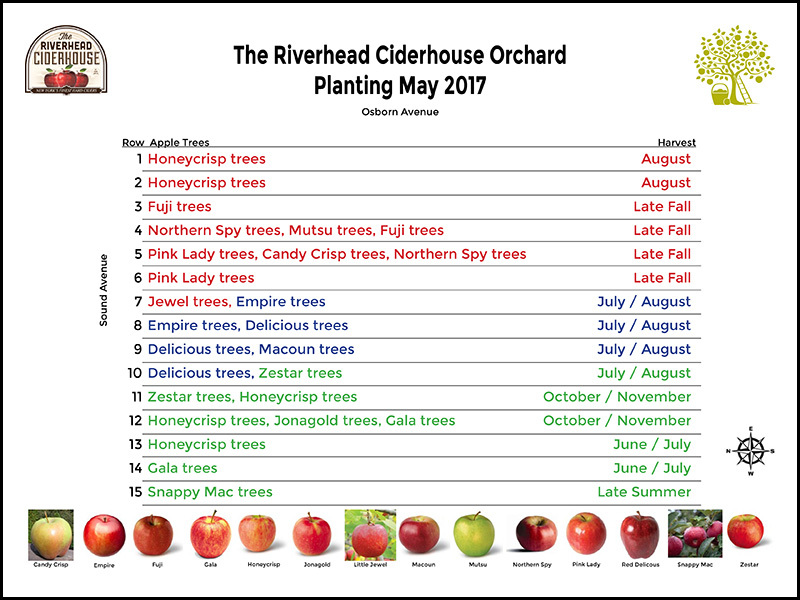 At the Riverhead Ciderhouse, we’ve planted 15 different varieties. You can see their names on the end posts of each row. These varieties were selected so that we will have ripe apples from late August into early November. For example, the Snappy Mac, Honeycrisp and Gala apples ripen in late summer while the Pink Lady, Northern Spy and Candycrisp ripen in late fall. Empire, Delicious and Macoun are somewhere in the middle. You’ll notice we’re using drip irrigation to water them – it’s the best use of water! We’ll also test the soil a few times each year to add the appropriate amendments to keep them healthy and happy. Healthy trees produce high quality, great tasting apple… and great cider!